We’ll show you all the ways how to hard factory reset your Samsung Galaxy S5, with or without erasing data. 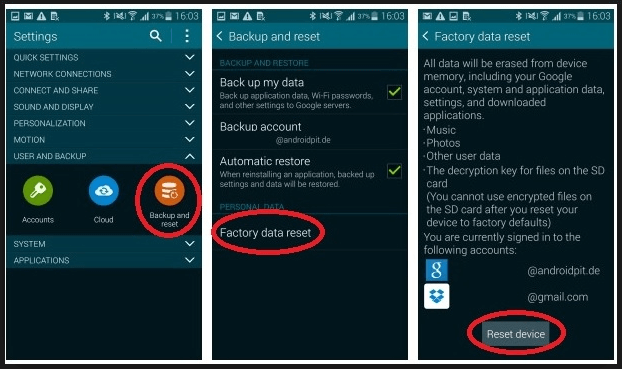 But before you will do the factory reset, please, make sure that you save all data from your smartphone like contacts, files, docs, all logins, and passwords etc. Because after reset procedure all your data will be lost or may be lost. All steps written in this article you can do with your branded Galaxy S5 by AT&T, Sprint, T-Mobile, Verizon etc. How Do I Perform a Factory Reset on My Samsung Galaxy S5? How long does it take to do a factory reset my Samsung Galaxy S5? Your device lets you perform a factory reset to delete all of your personal information from the device (the microSD card is not affected). This feature lets you ensure your data is removed before sending the device in for replacement or repair, properly disposing of the device, or giving the device to a friend or family member to use. Go to Settings > Backup and reset > Factory data reset. Review the information provided. If you have inserted an SD-card, select/dis-select the Format SD card checkbox (to delete the data on your microSD card). Then Tap RESET PHONE option. Touch DELETE ALL to delete all information and downloaded apps. Then Tap CONTINUE after entering the password. Importantly: If you’re wiping your Galaxy S5 to sell it on or give it away, then we recommend removing accounts before you factory reset. You can do this by going to Settings > Accounts, tapping on each account and then tapping More at the top right and Remove account. A factory data reset may help with a blank or frozen screen, apps crashing or freezing, keypad/touchscreen problems, can’t hear, device making noises, can’t make or receive calls, and device won’t sync. Press the Power button to chose option. Scroll to Yes — delete all user data by pressing the Volume down button. Press the Power button (Phone will erase all your data and makes like out of the box). After the process chose Reboot System Now and press Power button. When your S5 restarts, it should be clear wiped and ready to set up again devise. Good luck! The last one helps you to reset your phone withoun asking for confirmation. The process may take 2-5 minutes while your device removes your personal data and restores the Android platform to its original state. You can reinstall any downloaded or purchased apps from your Google Play store account. If your device does not respond or you need to restart your Galaxy S5 without erasing any data yoг can use soft reset method. A soft reset is a simulated battery removal. This is used to power a device off when the screen is frozen or unresponsive. It does not cause loss of personal data on the device. Step 1: Press and hold the Power and Volume down buttons for up to 30-40 seconds. Step 2: Wait as your phone restarts. This method also helps you to reset samsung galaxy s5 when it locked out.